Addiction solitaire is a fun version of the classic solitaire game you can play with a standard deck of cards or on a phone, tablet, or computer. Unlike the traditional version, this version does not use any concealed cards, and it is typically easier to win. The computer version of solitaire has been around since the early 90s and is hailed as one of the most popular online games. Last year, Microsoft announced that around 100 million users play some version of solitaire and around 20 billion games are played per year. Classic solitaire is difficult to win because there are a number of hidden cards, and you draw cards in threes. This makes it more challenging. With addiction solitaire, however, all the cards are laid out and visible, making it easier to win. If you are playing online, go ahead and skip the setting up section and move on to the rules instructions. No matter how you decide to play, chances are you are going to have a lot of fun! 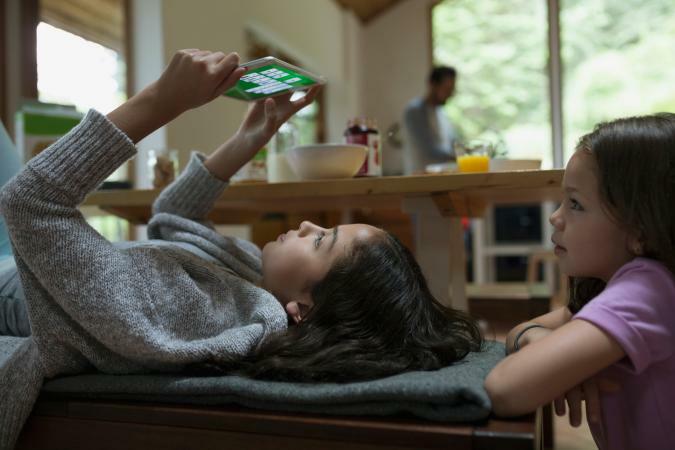 If you are not playing on your computer or phone, you will need a standard deck of cards and a large, flat surface area. Begin by shuffling your deck of cards. Lay all of your cards facing up in four rows of 13. Remove the aces when you come across them. This creates four holes in your rows. Now you are set up, aim to move two consecutive, same suit cards next to each other utilizing the holes left by the removed aces. Moving one card at a time, strategize to get as many cards in order as you possibly can. Remember cards on the left should always be lower in value beginning with the two and ending with your king. Twos can only move to the beginning of a row. 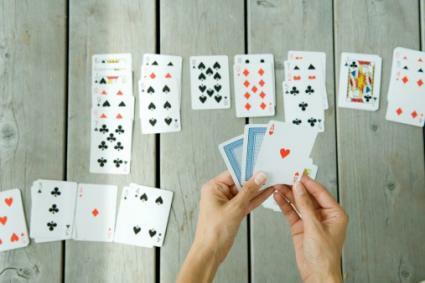 If you get stuck, leave your consecutive cards down and reshuffle the remaining, including your aces. You can do so as many as three times. After you reshuffle, lay out your cards as before and remove the aces so you have new holes to fill. Continue playing until all of your rows are in order and are matching in suit, or until you run out of shuffles. If you prefer to play online instead of using a deck of cards, there are plenty of free options available. When you access Green Felt, you are immediately taken to a new game. There is no logging in, downloading or payment required. 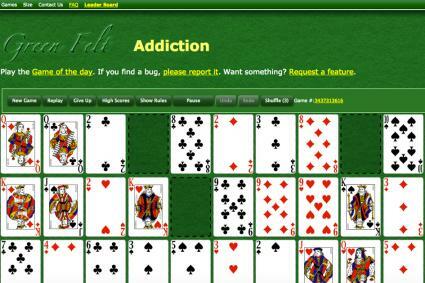 You can also head to their Green Felt's main page, click the games tab, and click the Addiction option under Solitaire. This site is easy to use and lets you begin playing immediately. This site offers free games that also do not require any downloading, logging in, or payment. When you head to the page for the game, a short ad plays and then the game pops up. This game only allows the player ten minutes to win. This version is fun for those who have already played and are looking for an extra challenge. Find the game under the Casino category of their game tab or search for it using their search bar feature once you are in the games section. Free Web Arcade is easy to use, free, and does not require any downloading or logging in to play the game. The game gives you ten minutes to complete a round. Find this game under the cards and casino category, or directly search for it their Free Web Arcade main page. There are no pop up ads, just some small advertisements at the bottom of the screen. Before the game starts, a short ad plays. You can skip it after five seconds. Click play and the game begins immediately. You can also access the game by heading to their NY Daily News site and clicking on the Entertainment section. Next click crosswords, and then cards. Addition Solitaire is an easy to access game that is fun to play competitively, or at your leisure. It is a great way to engage your creative problem solving skills and pass the time.